Having started FAVC, the first screen you see should be the "Source & Output" screen. Here is where most of the FAVC options are. First of all, under "Source Video Files", you can load in your input files in the order you wish for them to be placed on the DVD. Simply click on the first button on the right hand side (the magnifying glass over the document) to browse for the file(s) you want to load, use the green arrows to change the order and the red cross to remove files from the input list. Under the "Destination DVD Folder", select the folder you wish for the output DVD files to be stored. In the screenshot below, I've chosen "C:\temp" to be the output folder. FAVC will then create all of it's DVD output files within this directory, each DVD under it's own folder (for example, c:\temp\dvd 0\VIDEO_TS, c:\temp\dvd 1\VIDEO_TS ...). The "Iso Creation" option will create an .iso file in addition to the DVD folder that you can burn straight to DVD with your favorite DVD burning software - note that this doubles the space required on the hard-drive to store the output files, so I usually set this option to "No". The "Open ImgBurn" option tells FAVC whether it should automatically start ImgBurn to burn the newly created the DVD folder - again, I usually set this to "No", since I plan on testing the DVD compilation before burning. For "Temporary File Folder", specify where you want temporary files to be located. Temporary files will be stored under this folder in a new folder called "Working Folder n" (where "n" is a number, for example c:\temp\Working Folder 0\). For the "DVD Format" option, select one of "PAL" or "NTSC" based on what type your input files were (see Step 1 on the first page). For "Working Files", which are the temporary files created during the conversion process, you can specify here whether to keep the files (for editing, or use in other projects) or to delete them (normally, select "Delete" since you won't need these temporary files). For "Disc Capacity", specify the size of the media you plan on burning the DVD to (4.37 GB single layer, or 7.95 GB dual layer media), or specify a custom size. "Chapter Length" specifies where the length between automatic chapter stops - by default, FAVC will create a chapter every X minutes based on this setting. "Menu" specifies whether you want the DVD to have a menu or not - normally, if you have more than one video file and you want to be able to select which one to play as opposed to playing them one after the other, then select "Yes". Otherwise, if you only have one video file or just want the multiple video files to play after each other, then select "No". Lastly, "Shutdown" will tell FAVC whether it should shut down the computer after encoding - useful when you want to encode something overnight, otherwise set to "No". You may have noticed I left out explaining an option from above, namely the "Encoder" option. This option tells FAVC which MPEG-2 encoder it should use, and so it's a very important option. Selecting one will enable further encoding options for that decoder (note the "QuEnc Options" and "HC Options" tabs within FAVC). This guide covers instructions for both types of encoders (Step 4a and 4b - you only need to follow one of these steps, not both). So which encoder should you use? QuEnc or HC? Personally, I prefer HC, mainly because I've read some good things about it and it has been updated more frequently and recently than QuEnc (QuEnc was last updated January 2007, while HC's last version came in May 2007). But HC does not support multi-core encoding for the 2-pass encoding mode, so QuEnc may be faster for multi-core CPUs in 2-pass encoding. Click on the "DVD Options" tab at the top to access the DVD compilation options. The first part of this section allows you to specify the menu text, basically the names of the individual video files/titles and the name of the DVD itself. If you've selected "No" for the "Menu" option previously, then this option, along with the "Background Menu Image" option will be grayed out. The "Background Menu Image" allows you to load a picture to use as the background of the menu. Once you have modified the text and background, press the "Preview" button to preview how your menu will look. You can also add subtitle files for each video. You can select each video file and then click on the load button the right hand side to add a .srt subtitle file for it (or press the red cross to remove the subtitle file). The subtitle file will be user selectable on the DVD (so it can be turned off), unless you check on the "Hard Subtitles" box, in which case the subtitle is "burned" into the video file and cannot be removed. Now skip ahead and click on the "Audio Options" tab at the top. 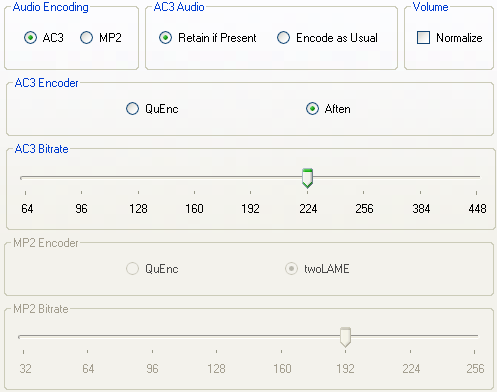 Here, you can select what type of audio encoding will be used, AC3 or MP2. Selecting AC3 is recommended, and if your input video contains 5.1 channel audio, it will be preserved when re-encoded. MP2 does not support multi-channel audio. If you did select AC3, then you have the option to "retain" or use the current AC3 soundtrack that your input file might have, or to re-encode it again - of course, if your input file does not have AC3 audio, then this option is meaningless. You can also choose to normalize the audio. You can also choose a decoder to use, the default selected "Aften" for AC3 and "twoLAME" for MP2 audio will do. You can then choose a bitrate for the audio encoding - traditionally, 192 or 224 kbps is good enough for 2 channel audio. 384 or 448 kbps is used for standard 5.1 channel encodings. There is also an "Advanced Scripting" tab which allows you to add custom commands at various processing stages. This guide does not cover these options, and you don't really need them for making basic DVDs. The next page/step shows QuEnc encoding options. You can skip this step and move onto Step 4b if you chose to use HC as your encoder.